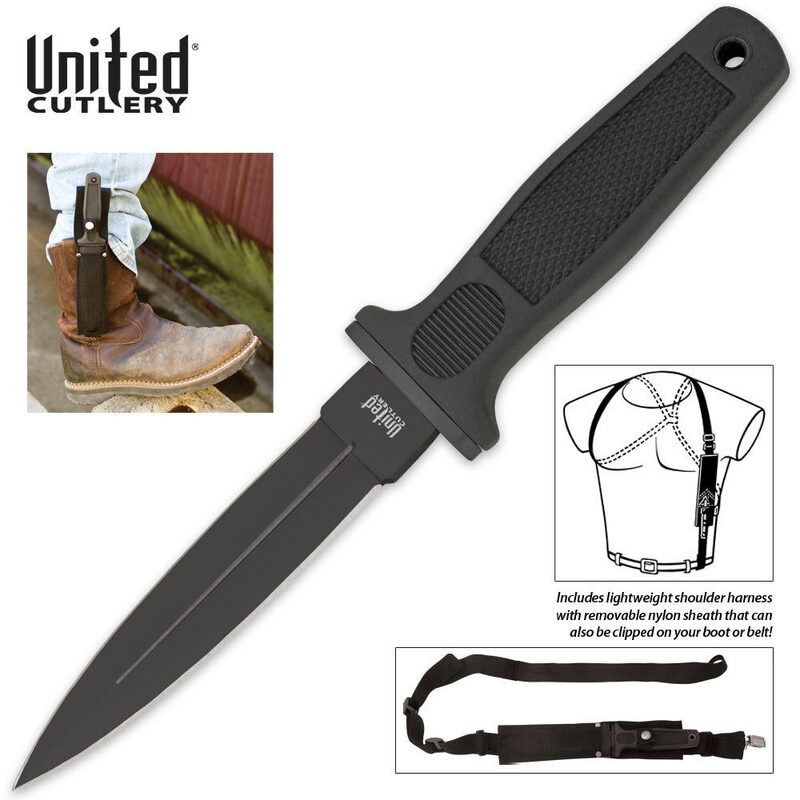 United Cutlery Undercover Boot Knife Black & Shoulder Harness | BUDK.com - Knives & Swords At The Lowest Prices! This Undercover Boot Knife will definitely keep you covered! The black guard and push tang construction add to the many features of this knife. I've had this model for 12 years. Over that time I've had plenty of knives come and go. This is still with me. I believe it is full tang or near to it. The rubberized handle Is durable and grip. My favorite part about his double edged knife is its balance, it just feels great using and throwing (after practice). Of the 50 or so quality blades I own this own is top five for sure. I can't believe the same knife has been produced so long either (if it's not broke, don't fix it), I just stumbled on here and am going to buyanother and get it engraved. Thank you United Cutlery. Everything about this knife is great, except that it came almost without an edge. I'm pretty sure that there are sharper butter knives. I bought the boot knife not really knowing it had a shoulder strap. I use it all the time. I also think the wear and tear of the shoulder strap will let go faster then intended. the harness is not made out of good material. change the harness and it will be a greater product. The knife itself is sturdy, It was dull on arrival; however, nothing a good whetsone or knife sharpener woudn't fix; the biggest draw back is the shoulder harness comes with no directtions and is hard to figure out. the straps do ot appear that would last for any length of time, and use as a bootknife, well, is uncomfortable. the metal clip one the sheath to clip onto the boot has a bend that protrudes and makes it uncomfortable; overall the knife itself is above average. nice weight and appears that it will hold age nicely; appears to be of superior strength. When I got this knife was so exited to see what it could do I took it out side and started throwing it with a friend we both were very pleased so we started stabbing soda can to see how it held up and it was still just as good 40 or so cans later great knife buy it and you will be 500% satisfied. When I first got this knife I couldn't wait to try the shoulder harness, but they gave me 2 straps and no instructions on how to do it which was a little upsetting. The knife came duller than a butter knife but a good grit stone fixed that. Over all I wouldn't spend this much on this knife but it feels sturdy and has a nice weight to it.